As those of you who are not Amish hermits already know, on Friday Egyptian dictator Hosni Mubarak fell from power after thirty years. Like a lot of people, I’ve been glued to the news, and my two primary sources of news have been two places I’ve never turned for news before: (1)Twitter and (2)Al-Jazeera. Without a doubt, searching the #Egypt and #Jan25 hashtags on Twitter gave the fastest, most up-to-date picture of what was happening on the ground in Egypt. Often, things I saw on Twitter would then show up on the Al-Jazeera newsfeed fifteen or twenty minutes later. I occasionally checked CNN or Fox News, but mainly just to see what angles they were taking in their coverage. I wanted to write one last post as a transition back to the normal content of the blog, where I prefer to talk about writing and science fiction conventions and post interesting pictures. I don’t want this blog to become about politics, or the philosophies of democracy, or the big news events of the day. But three of my past four blog entries have been about precisely those topics, because for the past few weeks, the people of Egypt have been telling some incredible stories. Ayman Mohyeldin, Al-Jazeera’s on-the-ground correspondent, who made it into Tahrir Square almost every day and at one point was arrested by the Egyptian Army. Wael Ghonim, the Google executive whose arrest was caught on video (at about the 1:15 mark), and whose release several days later sparked new life into the protest movement. Mona Eltahawy, an Egyptian journalist living in America who posted almost nonstop through the whole thing, and whose reaction to the fall of Mubarak touched everyone who saw it. Of course, towering above it all was the story of Hosni Mubarak, the Egyptian war hero who became a president, who became a dictator, who became a national disgrace. Those are just some of the stories that I’ve been able to follow. There are hundreds of Egyptians dead, most brutally murdered by their own government, who have stories of their own. Most of those stories, the rest of the world will probably never hear, and that makes me sad. But I’ve said it before, and I’ll say it again: these types of stories fascinate me, and draw me in as a writer and a storyteller. Too often, we leap for the commentary, or the larger meaning, or the political implications, and we don’t listen to what the stories of the people themselves can teach us. I said this about the Afghan girl Aisha, back when her story made the cover of TIME. And I say it again now. The real truth of an event lies in the stories of the individuals, not in what some pundit or news anchor is interested in spinning. And thanks to Twitter, the Egyptian Revolution allowed more of us to see more of these people’s stories than ever before. Another thing I’ve said before, but will keep repeating: stories humanize people. They teach us to have empathy for people who are different than we are; they let us see things through others’ eyes. Maybe that’s why the outpouring of stories from Egypt is so refreshing; Muslims and Arabs are so often de-humanized into stereotypes in the American media, that it’s nice to see confirmation of what I firmly believe: that across the world, people really aren’t so different from each other. And also, that people usually aren’t the stereotypes and simplistic images they’re portrayed as. Especially when there are 80 million of them, as there are in Egypt. There’s one last thing I want to mention, and it’s on the subject of idealism versus realism. A lot of people have pointed out, correctly, that Egypt has a long way to go before it has a working democracy, and there is plenty of room yet for things to go wrong or even totally off-track. They fear that Islamic extremists will take power, or that a new military dictatorship will take hold, or that Egypt will renege on its peace treaty with Israel and plunge the region into chaos. To be honest, I feel like those people have been paying too much attention to what pundits have been saying and not enough to what Egyptians have been saying. But that aside, there is this deep-rooted scorn of idealism in certain parts of American (and, indeed, world) politics; the beliefs that things do not get better, or that fighting for change is asking for trouble. But there are enough naysayers in the world, in my opinion. I’ll choose to be one of those people who does believe that things can get better, that the world can improve. Indeed, that it is improving. I’ll stand with Mona Seif and Wael Ghonim, not Matt Drudge and Glenn Beck. And I will usually choose to believe the best in people. It’s the lesson I glean from the stories I hear and read. And if that makes me a naive idealist, well, I can think of worse ways to go through life. The story of Egypt’s fight for democracy is a long, long way from over; even as I wrote this entry, tensions are persisting, and the military and the protesters are at odds. No doubt there will be problems ahead. But on Friday, the people got to have their say. And I feel privileged that I got to watch it happen. Even it was from 7,000 miles away. In my last entry, I posted the following link. It’s an Egyptian woman named Mona Seif, calling into a Speak-to-Tweet service which allowed people in Egypt to post voice messages to Twitter via phone after the regime cut off Internet service. If you haven’t listened to it, please do. I thought the hope and determination in her voice was incredibly inspiring; she seemed to be speaking for a whole generation of young people, and indeed a whole nation, that yearned to be free. Above all, she was confident. She told the outside world not to worry, that she wasn’t scared, and there was tremendous optimism in her voice. Just a few minutes ago, I found the following video on Youtube. I’m pretty sure it’s the same person, Mona Seif, trapped in Tahrir Square as Hosni Mubarak’s thugs turned a nonviolent protest into a battle, and a dream of freedom turned into a nightmare of brutality and gunfire. I had previously said that at least Hosni Mubarak was no Saddam Hussein; in light of recent events, I have to retract that comment. Mubarak is just another evil dictator, cut from the same cloth. America has supported Mubarak in the past, for the sake of peace, but now we see how interested in “peace” Mubarak really is– he’s willing to turn a peaceful demonstration into a massacre, if it means he gets to stay in power just a few more months. America and the rest of the world should do whatever it can to ensure that Mona Seif’s dream becomes a reality. The sooner the better. 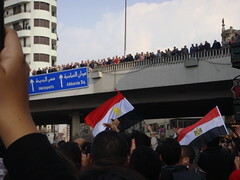 Like many all over the world, I’ve found myself glued to the news feeds this past week, watching the protests grow and unfold in Egypt. Hosni Mubarak, the Egyptian “President” who was been in power since 1981 (30 years! ), is now hanging by a thread. Cairo is almost 7,000 miles away from my own city, Seattle, and I will freely admit that I am no expert on Middle Eastern politics. But as an American, when I hear the voices of the protesters, I hear the same yearning for freedom and opportunity as when I read the opening paragraphs of the Declaration of Independence. In another time, another life, the man at 0:45 in this video could have been one of the founders of my own country. I’m not angry at my government for attempting to protect its interests in the Middle East… although that picture does suggest that money has been funneled to the wrong places. Up until now, Mubarak has seemed like a necessary evil, someone who provided stability and at least partial liberalization (he was no Saddam Hussein). But now that the Egyptian people are so clearly demanding that he go, it is time for America to decide whether to continue to engage in games of realpolitik, or to fully embrace the principles that our own country was founded on: like freedom of expression; like the right to life, liberty, and the pursuit of happiness. It seems to me, from my vantage point 7,000 miles away, that the people marching across Egypt now share the same sort of radical idealism that fueled America’s founders. This is not an Islamist uprising in Egypt; this is an uprising for freedom, this is an uprising to throw off the shackles of oppression, and in my opinion, we should support it wholeheartedly. That’s not to say I think America should get involved militarily or anything; that would be a complete disaster. This is Egypt’s revolution, for better or worse. It seems that the best we can do is provide moral support to the protestors, and exert what diplomatic influence we can in favor of a peaceful resolution that ends, hopefully, with Mubarak stepping down. But I have no control over what my government does tomorrow and in the days to come; my own inability to do anything but watch events unfold is something I find incredibly frustrating. I’ve been doing what I can to help spread the word… one of my Tweets today got re-tweeted about 100 times, but even then I don’t exactly have a loud voice. Whatever happens on Tuesday and beyond in Egypt, I hope it ends in democracy. Not democracy from the barrel of a gun, as George W. Bush and the neoconservatives tried to impose in Iraq, but true democracy, democracy that lives up to its name: power of the people. And to hell with American realpolitik. In the long run, a government that truly serves the Egyptian people will be in the best interests of everybody. Yes, I’m an idealist. But so was the person who wrote the two paragraphs below. Seems like they could apply to Egypt, don’t they? Or Tunisia. Or any of countless autocratic and repressive regimes around the world.